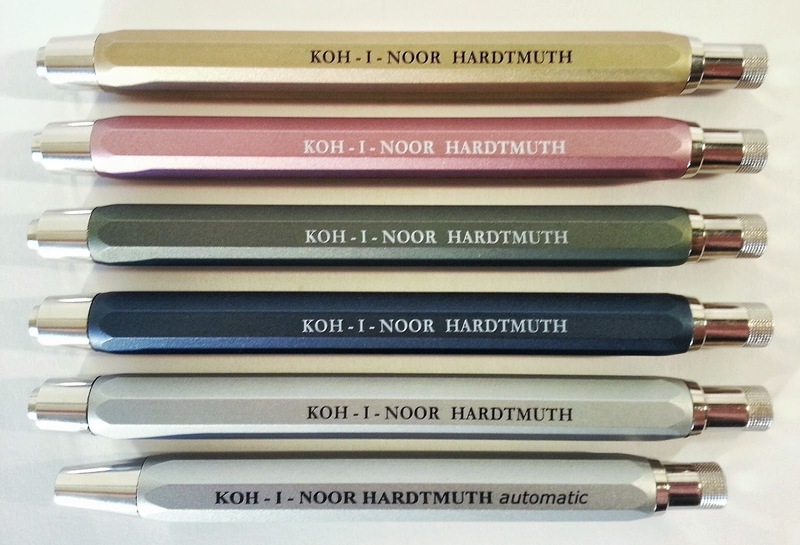 KOH-I-NOOR hardtmuth 5.6mm leadholder madness! 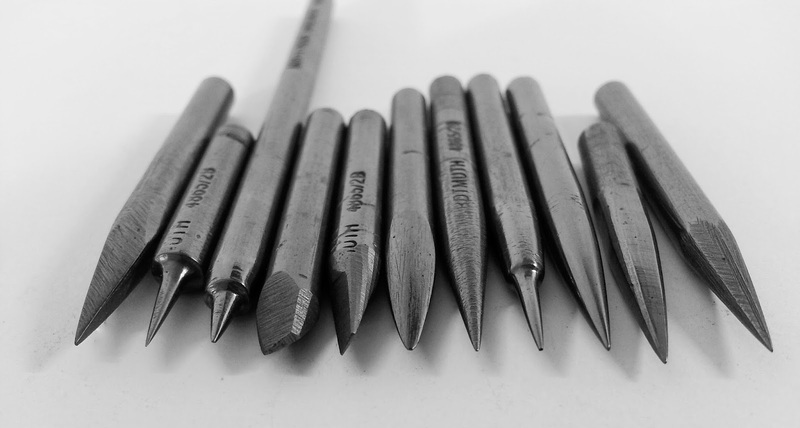 The reason I like these pencils so much must be the fact that I like to use them for drawing and sketching (which is basically what they are made for!). But strangely, I also like to write with them, so they can basically do everything I need a pencil to do. I also like the way they look and feel, it's a solid brass mechanism, which makes it very heavy, and it has a sturdy aluminum barrel, available in different finishes. Oh, and it's reasonably cheap! It's a 5.6mm leadholder. Now for the people that aren't familliar with leadholders, basically they are just mechanical pencils, with a slightly different mechanism, and way thicker leads (2mm is the smallest, up to 12mm or so for pastel crayons) So this one is already one of the more thicker leads. But with 5.6mm lead being quite uncommon, the only hardness I seem to find is 2B, which is still okay for me! The smaller one in the picture above is an automatic version. It's basically the same pencil, except for the mechanism being very similar to normal mechanical pencils, unlike the others that are drop-lead type! 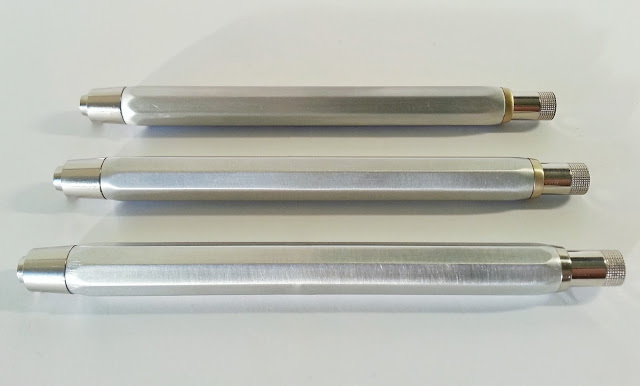 Another thing I like about lead holders, is the fact that they can be sharpened in a more traditional way, using a piece of sanding paper (they sell small wooden planks with some layers of sanding paper on it, in almost every artist's supply store) And I really like to take my time and think of new ways to sharpen it to a more effective point. I did buy some of them that weren't painted properly, as the paint would come off after some use. So I decided to mess around with them. After sanding for a couple of hours, all the paint was gone, and there was just this raw aluminum finish left. I think they are even more beautiful than before, and they become even prettier after using them for an extended period of time. As I mentioned in the begining, the price is very reasonable, at about 8 Euros each. I also have some other 5.6mm leadholders from Koh-I-Noor and other brands, so if you'd like to read more about this type of pencils, let me know in the comments below. And don't forget to subscribe to my feed if you want to stay updated about my blog! do you have any suggestions for a new fountain pen? 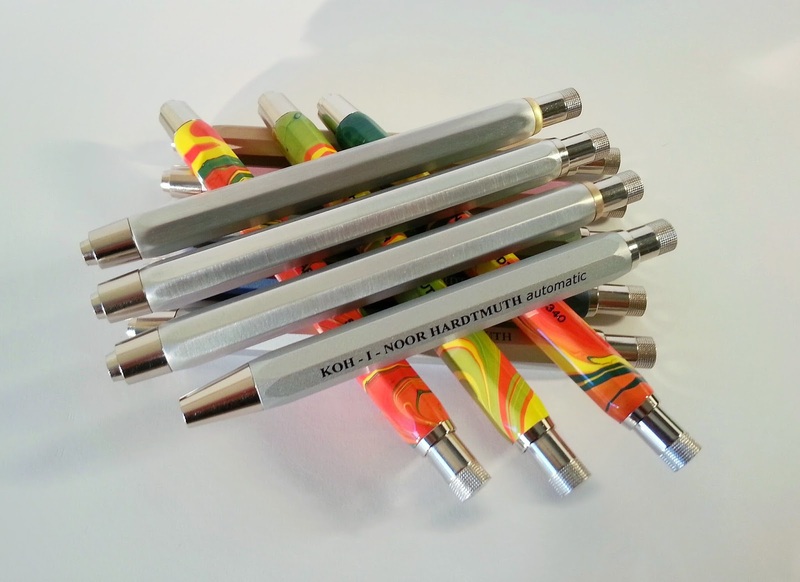 The KOH-I-NOOR shouldn't be too difficult to find, just look in any art supply store! About the fountain pens, it really depends on how much you'd like to spend, what kind of fountain pen (compact, flex nib, ...). If it is your first fountain pen or not. But let me know, send me an email with some more specifications, and I'll be happy to find something for you! 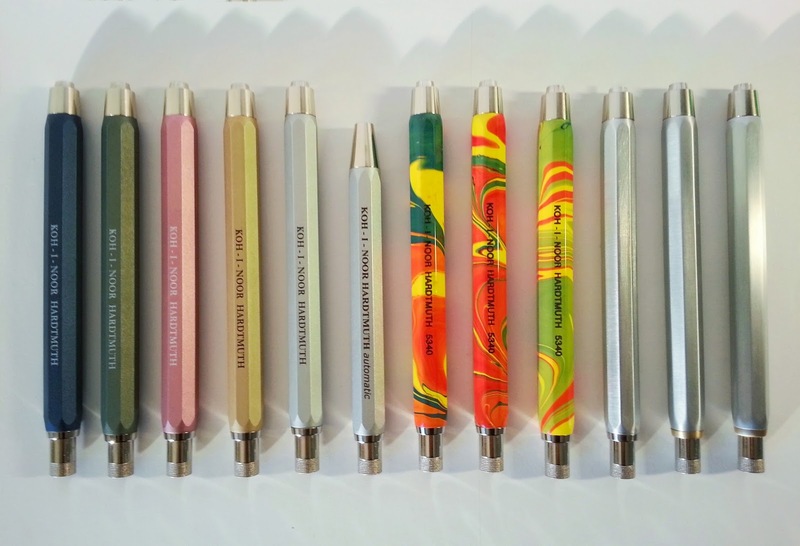 I bought a couple of these 5.6mm leadholders and numerous 2mm ones from the Hardtmuth outlet in Bucharest which was left over from the socialist times. The finish is excellent. The leads are not as good, especially the coloured 2mm ones which tend to break inside the pencil. The automatic pencils give the most trouble, I am Indian and for a long time Hardtmuth made wooden pencils under the Koh-i-noor brand name with V Perumal Chetty and Co. in Madras now Chennai in southern India. As I am biased in favour of Koh-i-noor, I have not switched brands as no company can match the variety of their products.My oldest Hardtmuth product in regular use is an Admiral 4415 pencil predating WW2. Nice! These are definitely my favourite pencils! Price/value they are pretty much the best you can get! I also have a two mm, and the leads are indeed not that great. For my two mm pencils, I tend to use Faber-Castell or Staedtler leads, they are incredibly smooth and quite strong! Question for the blogger: what kind of sandpaper or emery paper did you use to sand the pencils? Does any part of the inscription remain on the pencil or does it disappear with the paintwork? I use very fine sandpaper or synthetic steel wool ( same stuff as the abrasive side of a kitchen sponge) The synthetic steel Wool give the surface a more even appearance, but it takes a bit longer because it is not as abrasive. The branding does come off as it is just printed on top of the paint. And if you want the metal decorative ring to remain silver, you have to cover it up because the chrome finish will come off as well! Hi there! I'm from Brasil and recently just got the automatic version (exactly the same as your silver one) and I got one question. When I finished using it, I feel dificult to "push" the lead back into the mechanical pencil itself. Am I damaging the mechanism? Should I let the lead outside? I also noted sometimes I must push the button for releasing the lead a lot of times as it maintains the lead fixed in its position. Is this normal? Thank you very much for your attention and sorry for the bad english! Hey Raphael, nice choice! These automatic leadholders can be a bit finnicky, but yes what you describe is perfectly normal. 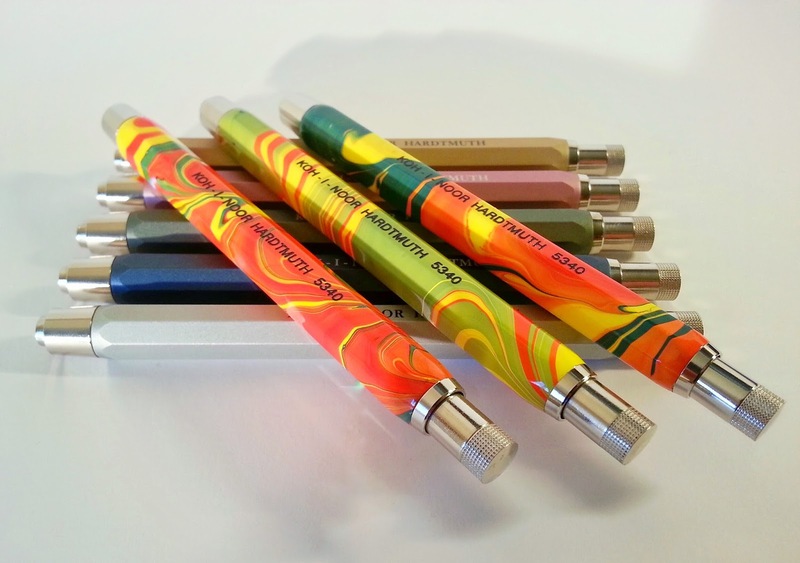 You can push the lead back, it works just like a regular mechanical pencil, only the mechanism is a bit stiffer.